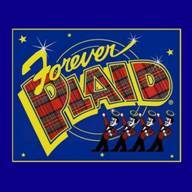 FOREVER PLAID is one of the most popular and successful musicals in recent memory. This deliciously goofy revue centers on four young, eager male singers killed in a car crash in the 1950's on the way to their first big concert, and now miraculously revived for the posthumous chance to fulfill their dreams and perform the show that never was. Singing in the closest of harmony, squabbling boyishly over the smallest intonations and executing their charmingly outlandish choreography with over-zealous precision, the "Plaids" are a guaranteed smash, with a program of beloved songs and delightful patter that keeps audiences rolling in the aisles when they're not humming along to some of the great nostalgic pop hits of the 1950's. You are sure to recognize classic hits such as: Three Coins in a Fountain, Papa Loves Mambo, Catch a Falling Star, Chain Gang, Day-O, Heart and Soul, Lady of Spain, and Love is a Many Splendored Thing.